COLD SPRING, NY--(Marketwired - Feb 20, 2014) - You're the doctor, so you dig out of the snow and make the treacherous drive to your office only to find a voicemail full of patient cancellations. If your dedication to patient care is met with icy opposition, you're not alone. Healthcare practices across the country are seeing record highs in patient cancellations and no-shows due to extreme winter weather. To battle the brrrr, many doctors are turning to telemedicine and telepsychiatry. Winter conditions often mean that a large majority of routine exams and mental health appointments are either cancelled or ignored. Some patients reschedule, some don't, leaving your practice and their health to suffer. With online video appointments through HIPAA-compliant telemedicine providers like CloudVisit Telemedicine, patients can keep their appointments and comfortably see their doctors without braving freezing temps or icy roads. Telemedicine, once reserved for long-distance healthcare, is quickly becoming the solution for safer, more reliable close-to-home patient care. "We're seeing a major shift in the definition of remote healthcare," said Daniel Gilbert, president and CEO of CloudVisit Telemedicine. "For many of our clients, remote means seeing patients online who live only ten miles away because travel risks are completely erased with telemedicine." "People still shop when it snows. They still bank, they still work; they just do it all online," Gilbert points out. "Patients who try a video appointment with their doctor out of winter necessity are very likely to fall in love with the convenience. Once patients experience the ease and comfort, they're hooked." The same is true of doctors and other healthcare providers who are using telemedicine to keep their practices profitable through snow-slammed months. Winter brings a wandering eye; patients may start to look for doctors a little closer to home or one with slightly better hours. With CloudVisit, doctors can maintain patient relationships and more comfortably offer evening "office" hours. "Simply offering telemedicine to patients can have a big impact on patient loyalty," said Gilbert. "Since CloudVisit is not a network, we help doctors preserve their brand and their hard-earned patients." 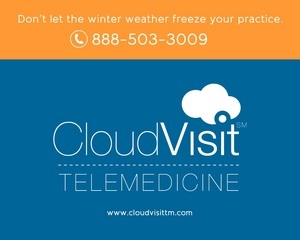 CloudVisit Telemedicine can have practices up and running with online patient appointments in a matter of days, so there's still time to outsmart winter. Those who register by February 28th can try CloudVisit Telemedicine free for one week.